Visual SI Advanced is now Dragonfly Pro! Introducing Dragonfly Pro, the latest renamed release of Visual SI Advanced. Dragonfly Pro is our commitment to making Visual SI Advanced more powerful and intuitive for our users. Explore the details on this site, watch the training videos, and most importantly see for yourself by downloading the free trial. You'll find that Dragonfly Pro brings you from raw data to rich results in less time, with ease. Dragonfly Pro adds the following features. 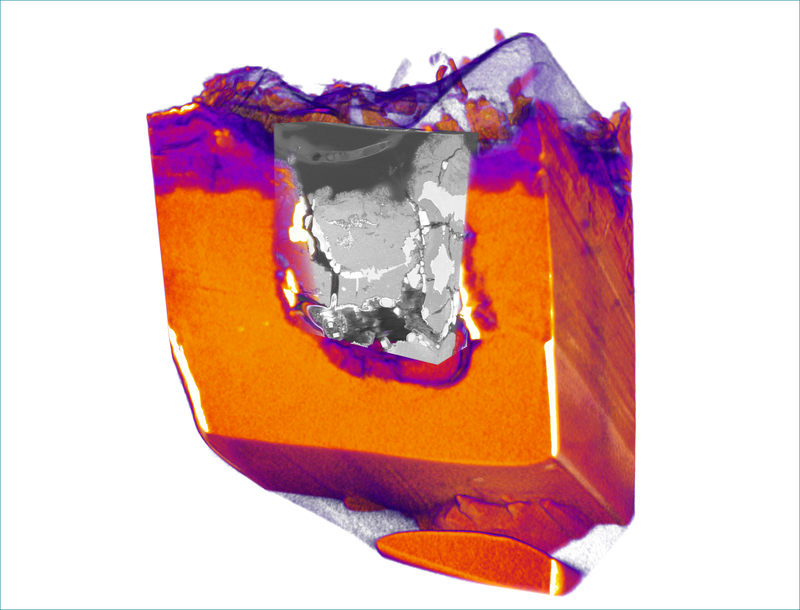 Dragonfly Pro from Object Research Systems (ORS) is an advanced analysis software solution for 3D data acquired by a variety of technologies including X-ray microscopy and FIB-SEM. 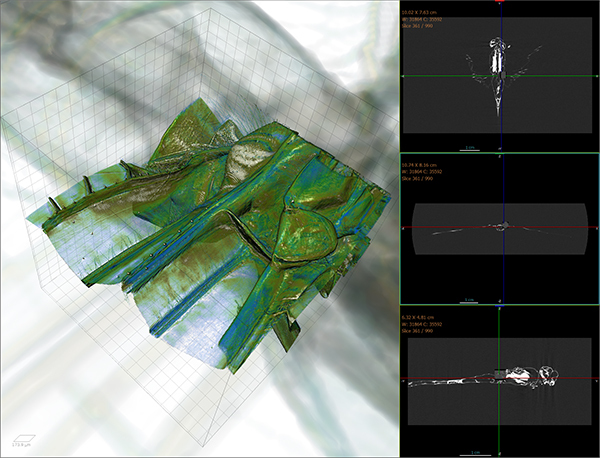 Using advanced visualization techniques and state-of-the-art volume rendering, Dragonfly Pro enables high-definition exploration into the details and properties of 3D datasets. 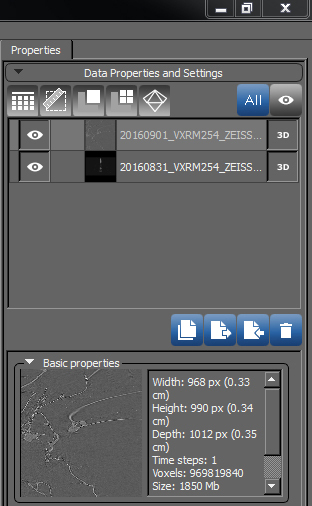 It offers 2D and 3D image filtering modules and thresholding. 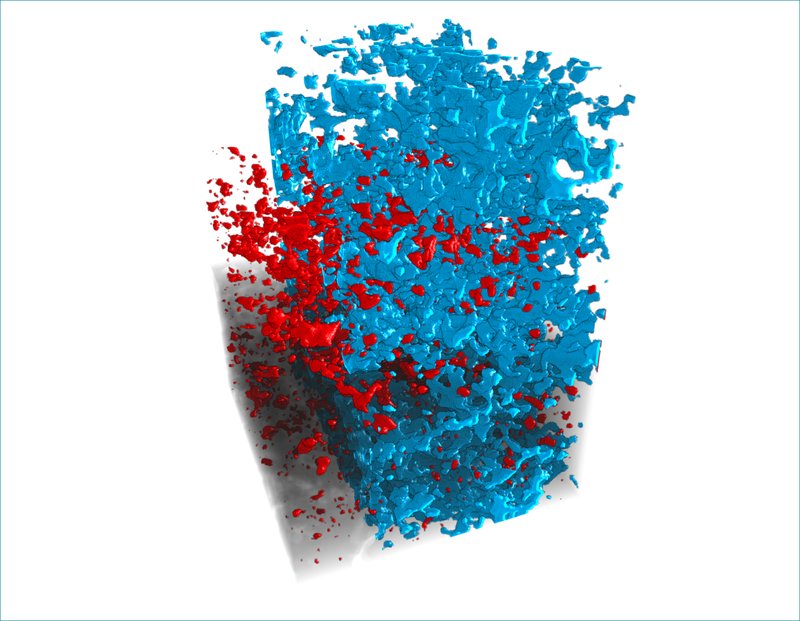 Segmentation can be performed automatically or with user assistance generating 3D surface reconstruction to visualize and measure properties, including areas, volumes, counts, distributions, and orientations. Dragonfly Pro delivers cutting-edge 3D imaging and analysis techniques with high display speeds and the ability to handle large datasets. Dragonfly Pro now enables Python scripting - a powerful feature that allows users customize their data processing and visualization needs. Users now have access to the data channels and properties within the interface creating a limitless post-processing environment. Dragonfly Pro is easy to use. With minutes of experience, you can explore, navigate, and annotate your dataset. In a few hours, gain control of more advanced tools such as image processing, segmentation, object analysis, and movie making. Use our compact, topic-specific training videos to familiarize yourself with Dragonfly Pro in the shortest amount of time. 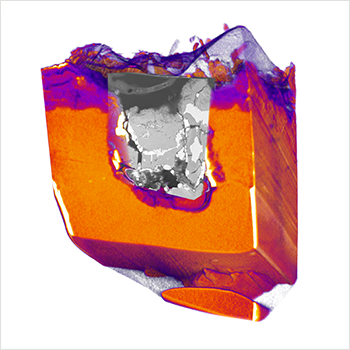 Multi-scale visualization of corrosion damage of a magnesium alloy. Imaged by ZEISS Xradia 810 Ultra and ZEISS Crossbeam 540. 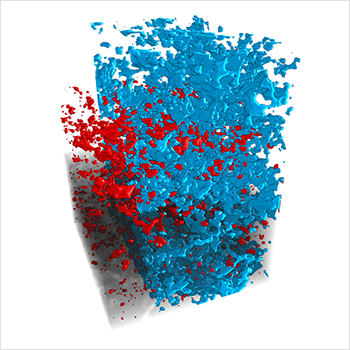 Visualization of connected (blue) and isolated (red) porosity of a thermal barrier coating. Imaged by ZEISS Xradia 810 Ultra. An email will be sent to your inbox immediately with a download link valid for 7 days. If you don't see it, please check your spam folder. Using advanced visualization techniques and state-of-the-art volume rendering Dragonfly Pro enables high-quality insight into the details and properties of 3D datasets. 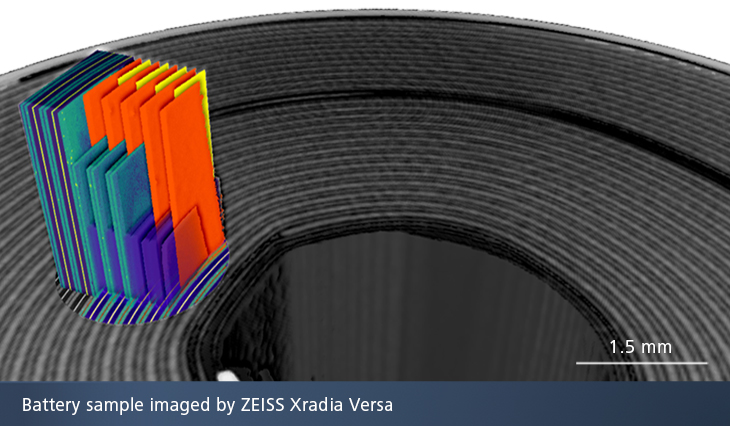 It offers 2D and 3D image filtering modules, thresholding, and automated or assisted segmentation with 3D surface reconstruction to visualize and measure properties including areas, volumes, counts, distributions, and orientations. Get started quickly with the online instructional videos! Go to to the Instructional Videos tab, and fill out the form for access to over 90 minutes of training, starting with a Quick Start Basic Training. Existing Visual SI Advanced Customers have complimentary access to the initial version of Dragonfly Pro. Both software packages will run independently on your Visual SI Advanced workstation as you make your transition to Dragonfly Pro. 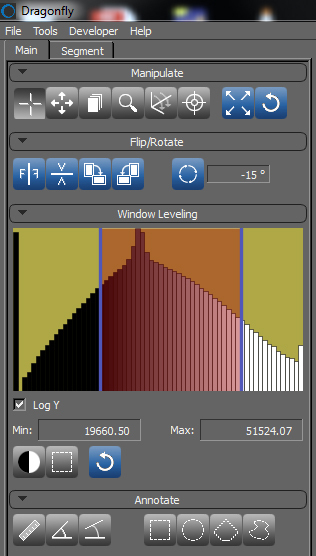 Keep your Visual SI Advanced software running as long as you like, it is a perpetual license. However, all feature improvements and continued development will be performed on Dragonfly Pro. We encourage you to transition and be part of its Python functionality and growing user community! Be sure to view the newly-produced Dragonfly Pro training videos. 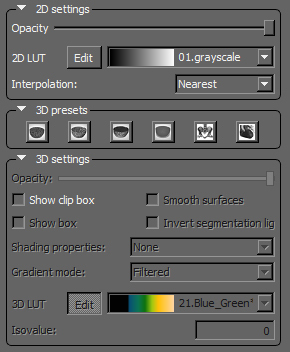 All topics from Visual SI Advanced have been reworked in the Dragonfly Pro interface. There are additional training videos available that showcase new features that Dragonfly Pro has to offer. Please begin with the Quick Start Basic Training. I'm an existing VSI Advanced customer without a current annual maintenence contract. Can I still get Dragonfly Pro? Yes, regardless of where you stand with your annual maintenence contract, you have complimentary access to the initial version of Dragonfly Pro. This does not reactivate or extend the terms of your maintenance contract. Do I need to upgrade my workstation to support Dragonfly Pro? No, Dragonfly Pro will run on your existing Visual SI Advanced workstation with dedicated professional graphics. Please note that Dragonfly Pro is not supported by integrated laptop graphics. Do I have to run Dragonfly Pro on the same workstation that runs Visual SI Advanced? Yes, Dragonfly Pro must be run on the same workstation as you are currently running Visual SI Advanced. If you need to transfer to another workstation, transfer both software through the activation/deactivation process. Do I still have access to the Visual SI Advanced training videos? Yes, they can be found on the training videos tab of this webpage. Contact your ZEISS sales representative to purchase additional licenses. Please note that additional feature developments will be performed on the Dragonfly Pro platform. Rendering performed in Dragonfly Pro. Imaged by ZEISS Xradia 520 Versa.